The red Kopul Premium Performance 3000 Series XLR M to XLR F Microphone Cable (20') is designed to be an extremely quiet and flexible cable that is ideal for the most demanding live sound and performance applications. The cable is engineered to be durable and to provide protection against EMI, RFI, and static noise. While the cable's color-coding affords the ability to quickly differentiate between multiple connections on stage, it provides a pleasant aesthetic quality at the same time. 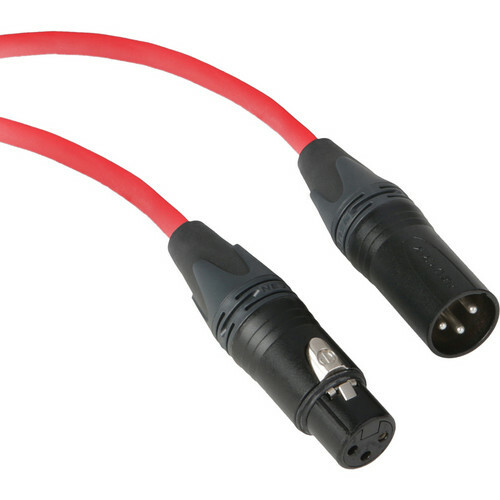 Premium Performance 3000 Series XLR M to XLR F Microphone Cable - 20' (6.1 m), Red is rated 4.9 out of 5 by 20. Rated 5 out of 5 by Jason from Works - But make sure you get the length you need. They work. I connect a RODE NTG2 with a Tascam DR-60mkII, and it sounds great. I'm not really a sound guy, but from the recordings I've gotten using this cable, I have not hear anything that makes me believe there's a problem. We try and practice correct cable wrapping and avoid having it drag on the floor, which has kept it in relatively good condition. While not a complaint, more so an observation: I bought this cable to be used in a boom mic/sound recordist set up, with the occasional studio style boom-arm podcast/voiceover/interview kind of thing. The 20' cable, while seemingly a good investment for the eventual possibility that I'd need a cable that long, has proven to be too long 100% of the times I've used it. It does not hinder the performance of the cable, however, it becomes tedious and cumbersome to typically deal with an extra 10' on average per usage. But hey, if I ever needed to rig a mic into a scene and have my sound guy recording from across the room, I can do that. Rated 5 out of 5 by Chris from Great Quality Cords! I was having a problem with inferior mic cords not seating properly in the microphones. After shopping around I purchased several of these Kopul cords and the problem was solved. Most 20' cords of similar quality are much more expensive. This was a great way to go all around. Rated 4 out of 5 by Noah A. from Perfect non-annoying orange. The connectors are good but not amazing. It's not something you'd think would matter much, but the orange is not too bright not too dim. It makes the specific cable easy to find without looking silly. Rated 5 out of 5 by Swolock from Good solid cables These cables arrived quickly. They are easy to snake and coil and seem to have good quality connectors. I'm using 2 of them to go from my keyboard (it has 2 XLR male jacks) to a snake. Rated 5 out of 5 by ralph from Great on a gig Great XLR cable at half the cost of others. Used yesterday on a gig worked seamlessly. I highly recommend it. I also love the color coded cable, for easy troubleshooting in the field. Rated 5 out of 5 by ralph from Great Cable on a gig Great XLR cable at half the cost of others. Used yesterday on a gig worked seamlessly. I highly recommend it. I also love the color coded cable, for easy troubleshooting in the field. Rated 5 out of 5 by BeerTv from Standard Cable with Better Length 20 feet of cable allows you to move your camera ANYWHERE. We never liked using the short 5 foot cables, especially when you need to plug your receiver into a wall. Sturdy as well. Rated 5 out of 5 by Channel 70 Productions from It pays to buy the best We'd bought the cheap stuff and then the cheap stuff failed at the worst possible moment. We won't make that mistake again.